Jonathan Schwartz has a job that many comic fans would kill for. He was an assistant to Kevin Feige during Iron Man 2, Thor, and Captain America: The First Avenger. Then on Guardians of the Galaxy he took on the role of co-producer. Now he’s returned to his role as a producer again on Guardians of the Galaxy Vol. 2. As we toured the set of the sequel in Atlanta in April 2016, we were taken into a small conference room lined with pre-production art and models. There were planets with trippy landscapes that look liked they came from ’70s album covers. There were new characters like Mantis, the golden Ayesha, and Kurt Russell’s mysterious character. And then there were the new ships and aliens. Jonathan walked us through each of them. Q: Are these all the different planets? Jonathan Schwartz: Yeah, these are a lot of the different planet names. There’s the Eclector, which is the ship Yondo’s on, the big Ravager’s home ship – which I’m sure you’ve heard me say at times. Contraxia, of course, we’re planning something from the comics – which is this very cool ice world we see the Ravagers on for the first time. It’s where we meet Yondo, this amazing forest planet. So yeah, these are a lot of the planet names. Q: Do we revisit some familiar locations like Xandar or Knowhere? Schwartz: There’s a little bit, very small piece, of Xandar in this movie. Nothing major. It’s really much more about expanding the cosmic side of the Marvel universe. Places you’ve never seen before. Then going back to revisit it. Q: Can you talk about, somebody mentioned is was more flashbacks or is it present day? Schwartz: It’s a few different periods of time, yeah. Q: Have there been any significant upgrades or updates to the Milano? Schwartz: It’s very much as we left it. The difference is the Guardians have been living in it for a few months – it’s not really ship made for that many people. So the extent that their high egos and rock ‘n roll sensibilities are starting to intrude on the family dynamic. That’s sort of reflected in the state of the Milano when we find it. Q: The Eclector is the Ravager ship, what’s Quadrant? Schwartz: Quadrant is another ship that we end up seeing in the movie that has something to do with the Eclector. As Rocket and Groot and Yondo make their escape, they end up on Taserface’s ship… possibly… not really. Schwartz: If you get captured by the Ravagers, yeah. Q: Yondo’s a character (with the tall fin) that’s a major callback to classic Guardian. Do we get any nods to any other things? Schwartz: It’s something we’re talking about. It’d be cool to do it. Q: What was the choice not bringing back the Collector from the start? Schwartz: I think part of it was about making the universe feel big. We love the Collector. We’d love to tell more of that story, but I think there’s so much more of the cosmic of the Marvel universe to explore that it’s about establishing new worlds and going new places. It wasn’t about visiting characters we’ve seen before. There are characters that’ll come up who have arcs that are unfinished, but there’s [none of] of the Collector in this movie. Q: What about Howard the Duck? Schwartz: I think that would be awesome. The good news about Howard the Duck is, he’s in all the effects, so he can have whatever moment he wants to figure it out. Q: Is it fair to say that Guardians in the MCU is the property that’s most able to chart its own path, separate from the comics? There’s more of a blank slate here for these guys than there are, for say, Captain America? Schwartz: I think that’s probably true. I think with the first Guardians, there was less of an audience expectation about what these characters needed to be. That sort of gave us, the filmmakers — James — a lot of freedom to kind of invent how they would appear to the film audience. So I do think having less audience familiarity with the comics in general allows a lot of room for invention. Q: Is this a scene of Star-Lord playing catch with his dad? Schwartz: [laughs] That wasn’t supposed to be here. It’s a very old piece of concept art. Schwartz: [laughs] Uh, I think it could be. You’d have to ask the artist who drew it. I don’t know if that’s in the movie. Q: These J’Son [Ego] planet exteriors, in terms of design, we’re looking at like, real sci-fi book cover, Yes album cover stuff here. 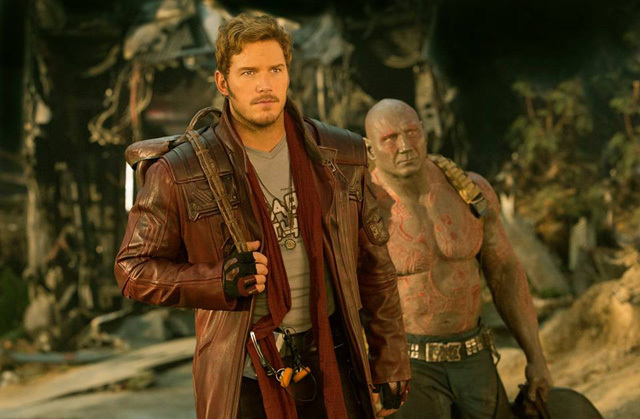 Is that part of the plan here, is to push – we saw some of that in the first Guardians – is the plan to push that fantastical, sci-fi aspect here? Schwartz: A hundred percent. The first Guardians has a really colorful, pulpy sensibility that I think we’re pushing further, in a much cooler direction in this movie. I think for the designs for this planet play into that tradition in a really cool way. It is about establishing a big, beautiful sci-fi world that’s not like anything you’ve ever seen before – which I’m sure something you guys hear on every set visit that you do. But we really mean it. Q: It seems like the team splits up. They’re on separate tracks? Schwartz: Yes. That’s accurate. Part of the meta-arc of the movie is what’s going to happen to the Guardians family. Are they going to stay together? So there is a big split that happens relatively early in the movie. Actually, whether they’re going to get back together or remain as a family is, very much, one of the big plots, or themes. Q: So they split up on purpose? Q: And that’s when Rocket and Groot sort of get in trouble? Schwartz: Yeah, so Rocket, Groot and Yondo have an adventure and the other Guardians have an adventure. Q: Is that motivated by Nebula’s presence? She seems like kind of a divisive figure since she was trying to murder them previously. Schwartz: It’s a lot of elements coinciding. Q: I know the answer is always the same when we ask this question, “That you’re focusing on this movie, and this movie alone,” but also you’re making a sequel in a world were franchise exists – and these things go to three or four movies. Is there a sense that this movie is leaving off in a place where you guys know where the further adventures are going? Or is this more of an “exquisite corpse” version, where’s it’s like, when the movie ends we’ll figure it out next year? Is there a sense of what the capper of the trilogy is going to be? Schwartz: I don’t think I’ve ever heard the phrase “exquisite corpse” before? Q: It’s the storytelling thing, where a writer will tell part of a story and then leave it off with a cliffhanger and then just pass it off to the next writer. Who then has to pick it up and figure out what to do next. Schwartz: I don’t think we’re doing that. [laughs] As I’m sure you’ve heard James Gunn say many times on many Facebook Q and A’s, “It’s really all about making Guardians 2.” It’s about making this movie the best movie it can be and the best version of itself. As we go, we think about, “This would be a cool thing to explore later. This might be something that could pop up somewhere else.” But it’s really about this movie the complete, full, amazing version of Guardians two we could possibly make. Q: Guardians had the most tongue-in-cheek post-credits sequence. Really, it was just sort of a nod but didn’t further the larger story in any way. Can you talk, obviously not specifically, but will this have something that’s a little more solid? Schwartz: More solid? Our post-credit sequences all come together in very unique ways. Some of them are written into the script Day One. Some of them we figure out much, much later. We have a couple things in mind for this movie, which are funny nods. Maybe there’s something that ties into something bigger down the line? We’ll figure it out when we figure it out, but I don’t know if that’s the plan just yet. Q: In the J’Son [Ego concept art] in the middle, it looks like there are big screens with scenes from the first movie on it. Is it fair to say that the people who are here have been watching the Guardians in some way? Sort of cataloging their actions? Schwartz: That’s actually a little misleading. It’s looked at for what’s actually going to be on those screens. 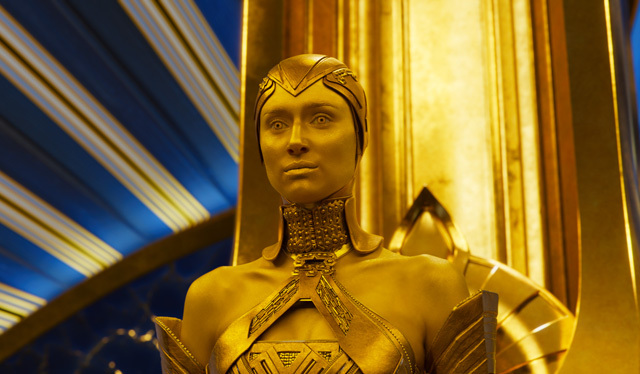 Q: At the end of the first movie, Guardians had a cohesive visual identity. They had their Ravager getup. It looks like they ditched that at some point? Is there something that ties it all together visually? Schwartz: I’d say, in the beginning of the movie a little bit, but less so as we go on. Part of them kind of, getting full of themselves and believing their own hype and fame. It’s the idea that they are distinguishing themselves visually a little bit. And you see that in the costume design. They are a little more rock ‘n roll. They kinda think they’re awesome now. Which is, at least, a little visual diversion. Q: See how the concept art of the pelvic sorcery scene over here? Is the relationship between Gamora and Quill the driving force here? Are we seeing them move towards something more solid? Schwartz: I wouldn’t call it a “driving force,” necessarily. I think seeing how their relationship evolves is cool. There is an evolution there that may not be the one you expect. Q: We expect romance. [laughs] Is that a topic something you’re toeing that line? Schwartz: I think the question, “Will they, won’t they?” question is always a fun one. Chris [Pratt] and Zoe [Saldana] like to talk a lot more about it. Really more than I can. Q: Where there any characters you guys were hoping to include in the film but it just didn’t work out in terms of narrative? Schwartz: Not really. As you heard Kevin [Feige] say, the core of this movie really came to us before it was formed and it really hasn’t changed that much. Since we got it, it’s changed a little bit — there’s little pieces that have been tweaked — but what you’re seeing on these walls and what we’ve been shooting for 47… 49 days… a long time, is very much, almost entirely what was on that docket. Schwartz: You’ll never guess who wrote that. [laughs] Michael Rooker was kind enough to come in and tag our conference room. I think maybe he thought that was a whiteboard? [laughs] It’s not. Q: Obviously a lot of great actors have come through the Marvel Cinematic Universe, but how cool was it to have Kurt Russell on set? Schwartz: It’s really cool. I have a hard time not fanboying out about it. But I keep it all inside. It’s really cool that he’s so passionate and committed to a movie like this, because I don’t think he’s really, necessarily done something like this before – which is part of what’s so cool about it. And he’s really into the character and into the mythology and loves it and is having a great time. That’s the other cool side of it. Watching that happen. It’s a real treat. Q: Are there any films that you guys turn to for inspiration when crafting the story? I know Civil War had some leads for in it. The Russos talk about being influenced by those movies. So was there anything you guys were using? Schwartz: There’s a movie called Guardians One [laughs]. Huge influence. I think James could probably speak more eloquently about what his specifics influences were coming up with the story and what his visual style derived from. That’s probably a better bet. Q: That’s smart you guys are keeping the identity, at least to us and the general public, of Peter’s dad a mystery. How much of that are you planning on keeping a mystery as we go into the promotion of this movie? Schwartz: It’s something that we talk about a lot. How realistic it is that we can really keep it under wraps for that long – because you guys are way too good at your jobs, which is a bummer. So… TBD. Schwartz: It’s not necessarily the biggest reveal in the movie – the actual reveal of who the character is. It’s not really the fun part. Q: So the movie doesn’t build to that? That’s just something that happens in the story that forms what happens later? Q: What is the fun part? Q: If it begins here and ends there, the final piece of art shows a more expanded Guardians team. Is it fair to say, by the end of this film the family grows a couple of members? Schwartz: There are a few members that will be helping the Guardians out along the course of this movie. Perhaps by the end of the movie, someone will have joined them onboard.